Comments: Broadleaf deciduous flowering tree native to the Western United States from Alaska to Southern California, and British Colombia in Canada. The species has dark green, 5" leaves with lighter tone on the underside, yellow flowers, and yellow-green winged seeds. Mature tree broad spreading and growing to a height of 40'. 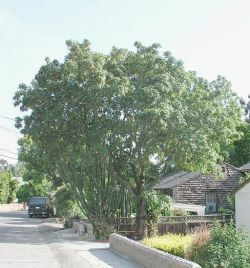 These trees can be found throughout Niles Canyon along with the Coastal Live Oak and Bay trees. An attractive tree with yellow to russet color in the Fall.